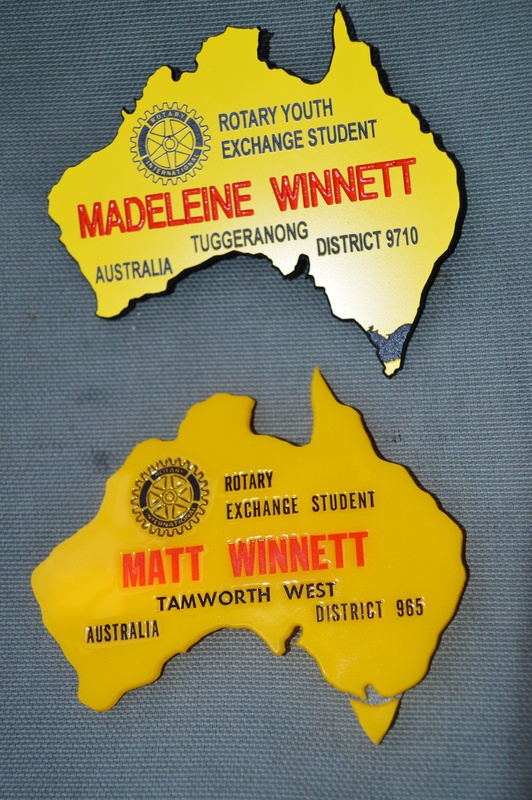 It is a longstanding Rotary Youth Exchange tradition for all Rotary exchange students to collect and swap pins with other exchange students while abroad. 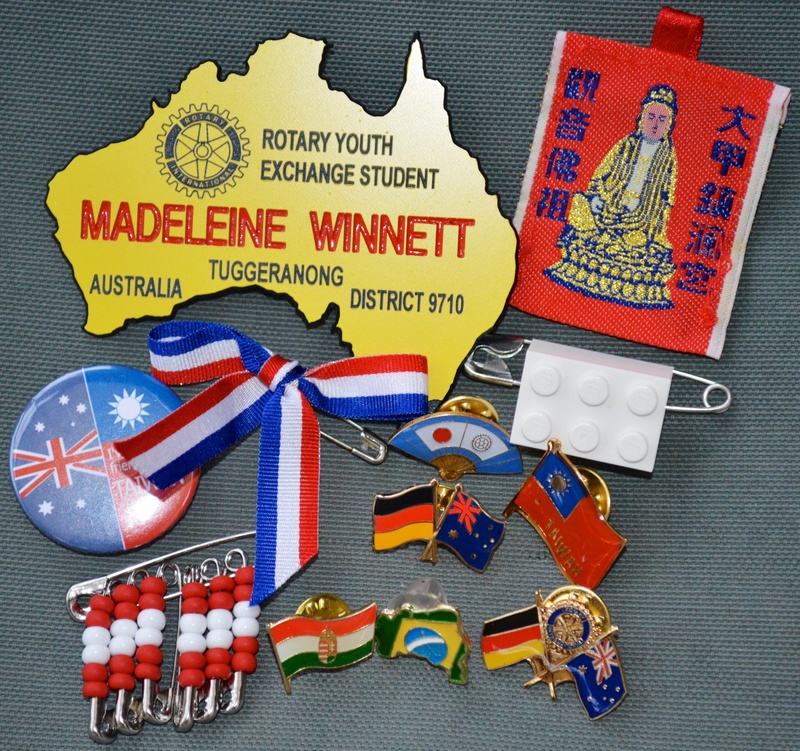 Each collected pin is then pinned onto their own Rotary Youth Exchange blazer. Every Rotary exchange student is provided with an official blazer to be worn while on exchange at official Rotary events and meetings and every country which participates in the RYE program has a different coloured blazer. As my Dad also embarked on Rotary Youth Exchange to Finland in 1989, he has his own collection of pins from around the world. The Australian blazers in those days were navy, however the colour scheme has since changed and they are now a bright bottle green. Although the colour of the Australian RYE blazers has changed in recent years, the name badge design is only slightly different, and I now have my very own name badge to match my Dads. 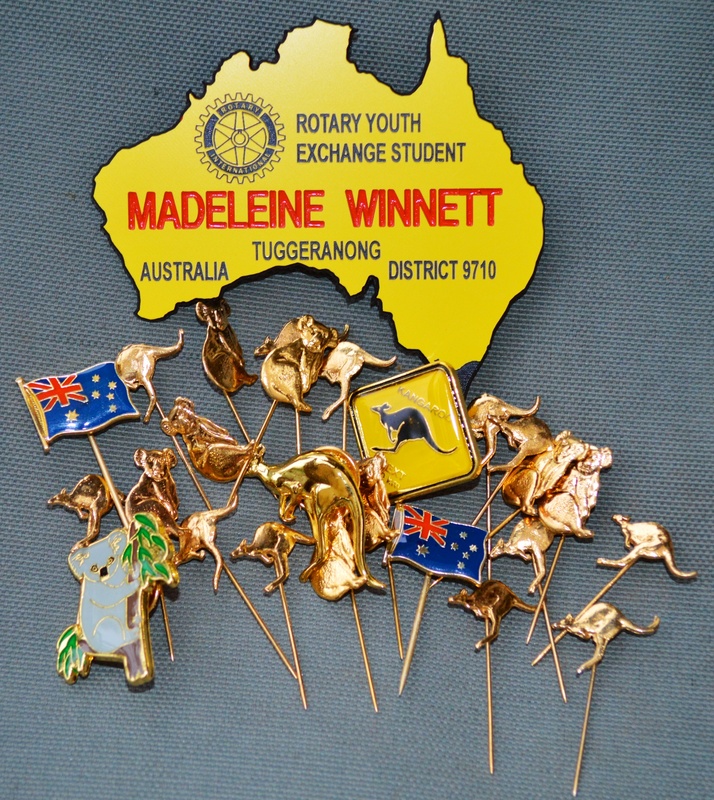 Since beginning my collection of pins which I have received from the inbound exchange students in my sponsor district, my Dad has also located some leftover Australian pins from his exchange. I have now added these pins to my collection and I intend to swap them with other exchange students while on exchange in Germany. At the second District 9710 RYE briefing weekend coming up this month, I will be presented with my very own blazer, and I will then be able to attach the pins I have collected so far to my blazer. It is now just 70 short days until I depart for Flensburg, and I am beginning to get excited! Making contact with those already on exchange in Germany has made it seem all the more real. I am yet to find out who my host families will be, but the news will come eventually. Once the school year has finished I will be able to devote more time to continuing my language studies (in addition to the German I have been learning through my school and the Saturday German school classes). I also intend to finish off the many sewing projects I would like to complete before departing in January. We are leaving the same day! Have the best time in Germany!